Succulents and Cacti have different needs than most other plants. Here are the most common mistakes when growing succulents and how to avoid them. Overwatering is one of the most common problems when growing cacti and succulents. As a general rule, plants should be watered in the summer on a 7 to 10 day intervals in well-drained soils. More often if the soil is sandy and less often if the soil is heavier. In the winter, irrigation should be reduced because most cacti go dormant. Tip for the summer: Learn about your plant water needs by checking the root zone 2 to 3 inches (5 to 7.5 cm) below the surface before watering. It should be dry. If in doubt, don’t water. “Cacti do not need water” is a myth. They need water to live just like any other plant. Temperature has an effect on the rate of desiccation. 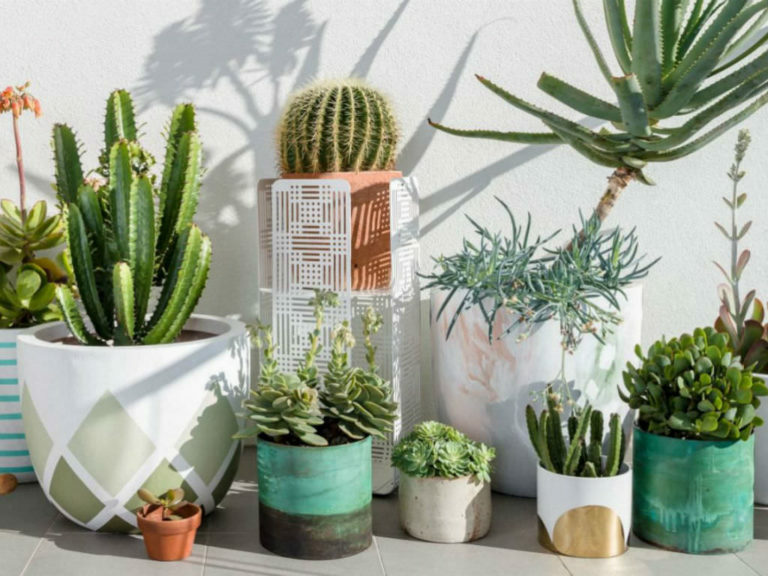 Many cacti and succulents do not need to be watered over the winter, but is best to give them a little bit of water to prevent the loss of roots. If a plant’s roots have dried up, water it very lightly until roots take hold again. Just because cacti and succulents are often found in arid habitats, doesn’t mean they can be placed or planted in full sun. Many species grow where they get a degree of shelter from rocks, larger plants and the environment. Growers should be cautious as they place their plants from a sheltered position into more light. Young barrel and columnar cacti and some Yuccas can be sunburn and the scars are permanent. Tip: Use a shade cloth (30%) to protect plants form the fierce summer sun. On the other hand, not exposing the plants to enough sun light creates pale, sickly, or abnormally-looking plants. Rotate plants often to expose the whole plant to the same amount of light. Many beautiful and inexpensive plants from local nurseries are planted in a peat-based medium. This medium is hard to water correctly and inevitably becomes too wet or too dry. We recommend using a commercial cactus potting soil, but mixed with something like perlite, sand, or small gravel. Good soil mixes for Lithops include 10 to 20 % potting soil and 90 to 80 % gravel. For most cacti and succulents a 30 to 40 % potting soil and 70 to 60 % gravel is recommended. A 50 % potting soil with 50 % perlite is a good mix for succulents like Sanseverias, small Agaves, and Yuccas. A 50 to 60 % potting soil and 50 to 40 % gravel is suggested for leafy succulents like Adeniums. Tip: Soil used for cacti and succulents must have some draining material. A common cacti and succulent faux-pas is the idea that they don’t need fertilizer! Like any other plant, they need a variety of macro and micro-nutrients to survive. While they get along just fine without it, sometimes a bit of fertilizer can be the key to having lush and green plants. It is very important to know the growth habits of your plants. For example, most cacti and succulents should be grown at temperatures between 75 to 90 ºF (24 to 32 ºC), and some may require trace minerals in the soil. These can be provided by fertilizing, but the common fertilizers must be used appropriately, usually at 0.25 strength, or a slow-release product should be used. Tip: A fertilizer for tropical plants is perfect. If your plant is variegated (light or pale green tinging towards white or silver), use a fertilizer with a lower content of nitrogen. The roots must have enough room to grow and thrive. The roots of plants that have grown in a pot for a long time completely fill the entire pot in a tight mass. This creates desiccation problems because water may have a hard time penetrating the mass. The roots also cease to acquire nutrients and the plant could perish. Tip: Repot when roots begin to show through the draining hole. Landscaping with cacti and succulents is becoming very popular, but poor planning may result in a disaster. Some key elements for success include building a raised bed by mounding the soil, or even constructing a large in-ground planter. This is similar to a raised vegetable planter. The bed should be elevated 8 to 12 inches (20 to 30 cm) above the surrounding area. A raised bed promotes drainage, an absolute if you want to be successful with a variety of cacti and succulents. The soil mix must be fast draining, but not too lean. A combination of expanded shale or pea gravel, with sharp sand and compost is a good general purpose blend. Test your blend. Water should not stand on the surface more than a few seconds before entering the soil. Plant early in the spring if possible, and be prepared to shelter plants under netting until they are fairly well established. Tip: Choosing the right landscape plants is best done with advice from those who have had success. For a dish garden use cacti and succulents with similar growing conditions. Use plants with watering at the same time such as ball type like Echinocactus, and taller growing Echinocereus, or maybe succulents with elongated or thick fleshy leaves. Use plants with the same growing seasons such as Haworthias and Aeonium for winter time, or Crassula with Sempervivum or Echeveria. Overall, cactus and succulents do not get infested by insects (such as scale) as often as other plants. However, they are susceptible and on occasion we must treat them with insecticides when manual removal of bugs is not enough. Plants treated with chemicals must be protected from the sun. Otherwise they will get burned easily, especially with products that contain oils. Tip: Isolate plants with scale or other insects, and protect them from the sun.